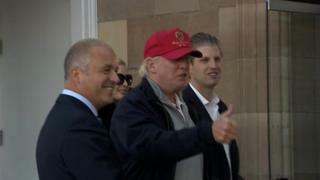 US property tycoon Donald Trump is in Scotland making his first visit to Turnberry golf resort as its new owner. His private jet touched down at Prestwick Airport on Tuesday evening and he arrived at the hotel and golf course in Ayrshire a short time later. He confirmed last month he had purchased the complex from Dubai-based Leisurecorp for an undisclosed sum. Mr Trump said: "I think it is really beautiful and we are going to make it the finest in the world." The course will continue to be managed by Starwood Hotels & Resorts. Turnberry is the only course in the Open circuit to be owned privately. Mr Trump has ambitions to host the Open at his other course in Aberdeenshire. In a statement in April, Mr Trump said: "I intend to invest many millions of dollars (pounds) in order to bring the hotel to the highest levels of luxury. "When completed, I believe that the Turnberry Hotel will be the finest and most luxurious hotel in all of Europe."